This document provides information about the enhancements added by RSTP to the previous 802.1D standard. The 802.1D Spanning Tree Protocol (STP) standard was designed at a time when the recovery of connectivity after an outage within a minute or so was considered adequate performance. With the advent of Layer 3 switching in LAN environments, bridging now competes with routed solutions where protocols, such as Open Shortest Path First (OSPF) and Enhanced Interior Gateway Routing Protocol (EIGRP), are able to provide an alternate path in less time. Rapid Spanning Tree Protocol (RSTP; IEEE 802.1w) can be seen as an evolution of the 802.1D standard more than a revolution. The 802.1D terminology remains primarily the same. Most parameters have been left unchanged so users familiar with 802.1D can rapidly configure the new protocol comfortably. In most cases, RSTP performs better than proprietary extensions of Cisco without any additional configuration. 802.1w can also revert back to 802.1D in order to interoperate with legacy bridges on a per-port basis. This drops the benefits it introduces. The new edition of the 802.1D standard, IEEE 802.1D-2004, incorporates IEEE 802.1t-2001 and IEEE 802.1w standards. This table shows the support of RSTP in Catalyst switches, and the minimum software required for that support. Catalyst 2900 XL / 3500 XL Not available. Not available. Catalyst 2948G-L3/4908G-L3 Not available. Not available. Catalyst 5000/5500 Not available. Not available. Catalyst 8500 Not available. Not available. See the table in the Port States section of this document for more information. The state of the port is mixed, whether it blocks or forwards traffic, and the role it plays in the active topology (root port, designated port, and so on). For example, from an operational point of view, there is no difference between a port in the blocking state and a port in the listening state. Both discard frames and do not learn MAC addresses. The real difference lies in the role the spanning tree assigns to the port. It can safely be assumed that a listening port is either designated or root and is on its way to the forwarding state. Unfortunately, once in the forwarding state, there is no way to infer from the port state whether the port is root or designated. This contributes to demonstrate the failure of this state-based terminology. RSTP decouples the role and the state of a port to address this issue. These two port roles correspond to the blocking state of 802.1D. A blocked port is defined as not being the designated or root port. A blocked port receives a more useful BPDU than the one it sends out on its segment. Remember that a port absolutely needs to receive BPDUs in order to stay blocked. RSTP introduces these two roles for this purpose. This distinction is already made internally within 802.1D. This is essentially how Cisco UplinkFast functions. The rationale is that an alternate port provides an alternate path to the root bridge and therefore can replace the root port if it fails. Of course, a backup port provides redundant connectivity to the same segment and cannot guarantee an alternate connectivity to the root bridge. Therefore, it is excluded from the uplink group. As a result, RSTP calculates the final topology for the spanning tree that uses the same criteria as 802.1D. There is absolutely no change in the way the different bridge and port priorities are used. The name blocking is used for the discarding state in Cisco implementation. CatOS releases 7.1 and later still display the listening and learning states. This gives even more information about a port than the IEEE standard requires. However, the new feature is now there is a difference between the role the protocol determines for a port and its current state. For example, it is now perfectly valid for a port to be designated and blocking at the same time. While this typically occurs for very short periods of time, it simply means that this port is in a transitory state towards the designated forwarding state. 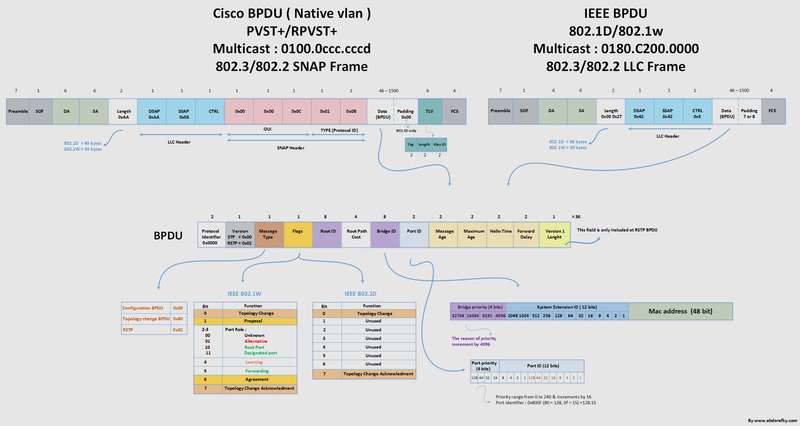 For a higher resolution image, see Cisco BPDU, IEEE BPDU, and BPDU diagrams. Note: Bit 0 (Topology Change) is the least significant bit. Another important change is that the RSTP BPDU is now of type 2, version 2. The implication is that legacy bridges must drop this new BPDU. This property makes it easy for a 802.1w bridge to detect legacy bridges connected to it. BPDU are sent every hello-time, and not simply relayed anymore. With 802.1D, a non-root bridge only generates BPDUs when it receives one on the root port. In fact, a bridge relays BPDUs more than it actually generates them. This is not the case with 802.1w. A bridge now sends a BPDU with its current information every <hello-time> seconds (2 by default), even if it does not receive any from the root bridge. On a given port, if hellos are not received three consecutive times, protocol information can be immediately aged out (or if max_age expires). Because of the previously mentioned protocol modification, BPDUs are now used as a keep-alive mechanism between bridges. A bridge considers that it loses connectivity to its direct neighbor root or designated bridge if it misses three BPDUs in a row. This fast aging of the information allows quick failure detection. If a bridge fails to receive BPDUs from a neighbor, it is certain that the connection to that neighbor is lost. This is opposed to 802.1D where the problem might have been anywhere on the path to the root. Note: Failures are detected even much faster in case of physical link failures. This concept is what makes up the core of the BackboneFast engine. The IEEE 802.1w committee decided to incorporate a similar mechanism into RSTP. When a bridge receives inferior information from its designated or root bridge, it immediately accepts it and replaces the one previously stored. Because Bridge C still knows the root is alive and well, it immediately sends a BPDU to Bridge B that contains information about the root bridge. As a result, Bridge B does not send its own BPDUs and accepts the port that leads to Bridge C as the new root port. The edge port concept is already well known to Cisco spanning tree users, as it basically corresponds to the PortFast feature. All ports directly connected to end stations cannot create bridging loops in the network. Therefore, the edge port directly transitions to the forwarding state, and skips the listening and learning stages. Neither edge ports or PortFast enabled ports generate topology changes when the link toggles. An edge port that receives a BPDU immediately loses edge port status and becomes a normal spanning tree port. At this point, there is a user-configured value and an operational value for the edge port state. The Cisco implementation maintains that the PortFast keyword be used for edge port configuration. This makes the transition to RSTP simpler. RSTP can only achieve rapid transition to the forwarding state on edge ports and on point-to-point links. The link type is automatically derived from the duplex mode of a port. A port that operates in full-duplex is assumed to be point-to-point, while a half-duplex port is considered as a shared port by default. This automatic link type setting can be overridden by explicit configuration. In switched networks today, most links operate in full-duplex mode and are treated as point-to-point links by RSTP. This makes them candidates for rapid transition to the forwarding state. In this scenario, a link between the root bridge and Bridge A is added. Suppose there already is an indirect connection between Bridge A and the root bridge (via C - D in the diagram). The STA blocks a port and disables the bridging loop. First, as they come up, both ports on the link between the root and Bridge A are put in the listening state. Bridge A is now able to hear the root directly. It immediately propagates its BPDUs on the designated ports, toward the leaves of the tree. As soon as Bridges B and C receive this new superior information from Bridge A, they immediately relay the information towards the leaves. In a few seconds, Bridge D receives a BPDU from the root and instantly blocks port P1. Spanning tree is very efficient in how it calculates the new topology of the network. The only problem now is that twice the forward delay must elapse before the link between the root and Bridge A eventually ends up in the forwarding state. This means 30 seconds of disruption of traffic (the entire A, B, and C part of the network is isolated) because the 8021.D algorithm lacks a feedback mechanism to clearly advertise that the network converges in a matter of seconds. Now, you can see how RSTP deals with a similar situation. Remember that the final topology is exactly the same as the one calculated by 802.1D (that is, one blocked port at the same place as before). Only the steps used to reach this topology have changed. Both ports on the link between A and the root are put in designated blocking as soon as they come up. Thus far, everything behaves as in a pure 802.1D environment. However, at this stage, a negotiation takes place between Switch A and the root. As soon as A receives the BPDU of the root, it blocks the non-edge designated ports. This operation is called sync. Once this is done, Bridge A explicitly authorizes the root bridge to put its port in the forwarding state. This diagram illustrates the result of this process on the network. The link between Switch A and the root bridge is blocked, and both bridges exchange BPDUs. This negotiation between bridges is only possible when bridges are connected by point-to-point links (that is, full-duplex links unless explicit port configuration). Edge ports play an even more important role now that PortFast is enabled on ports in 802.1D. For instance, if the network administrator fails to properly configure the edge ports on B, their connectivity is impacted by the link between A and the root that comes up. When a port is selected by the STA to become a designated port, 802.1D still waits twice <forward delay> seconds (2x15 by default) before it transitions it to the forwarding state. In RSTP, this condition corresponds to a port with a designated role but a blocking state. These diagrams illustrate how fast transition is achieved step-by-step. Suppose a new link is created between the root and Switch A. Both ports on this link are put in a designated blocking state until they receive a BPDU from their counterpart. The port is in the blocking state, which means discarding in a stable topology. The port is an edge port. In order to illustrate the effect of the sync mechanism on different kind of ports, suppose there exists an alternate port p2, a designated forwarding port p3, and an edge port p4 on Switch A. Notice that p2 and p4 already meet one of the criteria. In order to be in sync (see step 2 of the preceding diagram), Switch A just needs to block port p3, and assign it the discarding state. Now that all of its ports are in sync, Switch A can unblock its newly selected root port p1 and send an agreement message to reply to the root. (see step 3). This message is a copy of the proposal BPDU, with the agreement bit set instead of the proposal bit. This ensures that port p0 knows exactly to which proposal the agreement it receives corresponds. Once p0 receives that agreement, it can immediately transition to the forwarding state. This is step 4 of the preceding figure. Notice that port p3 is left in a designated discarding state after the sync. In step 4, that port is in the exact same situation as port p0 is in step 1. It then starts to propose to its neighbor, and attempts to quickly transition to the forwarding state. The proposal agreement mechanism is very fast, as it does not rely on any timers. This wave of handshakes propagates quickly towards the edge of the network, and quickly restores connectivity after a change in the topology. If a designated discarding port does not receive an agreement after it sends a proposal, it slowly transitions to the forwarding state, and falls back to the traditional 802.1D listening-learning sequence. This can occur if the remote bridge does not understand RSTP BPDUs, or if the port of the remote bridge is blocking. Cisco introduced an enhancement to the sync mechanism that allows a bridge to put only its former root port in the discarding state when it syncs. Details of how this mechanism works are beyond the scope of this document. However, one can safely assume that it is invoked in most common reconvergence cases. The scenario described in the Convergence with 802.1w section of this document becomes extremely efficient, as only the ports on the path to the final blocked port are temporarily confused. Another form of immediate transition to the forwarding state included in RSTP is similar to the Cisco UplinkFast proprietary spanning tree extension. Basically, when a bridge loses its root port, it is able to put its best alternate port directly into the forwarding mode (the appearance of a new root port is also handled by RSTP). The selection of an alternate port as the new root port generates a topology change. The 802.1w topology change mechanism clears the appropriate entries in the Content Addressable Memory (CAM) tables of the upstream bridge. This removes the need for the dummy multicast generation process of UplinkFast. UplinkFast does not need to be configured further because the mechanism is included natively and enabled in RSTP automatically. Once the root bridge is aware of a change in the topology of the network, it sets the TC flag on the BPDUs it sends out, which are then relayed to all the bridges in the network. When a bridge receives a BPDU with the TC flag bit set, it reduces its bridging-table aging time to forward delay seconds. This ensures a relatively quick flush of stale information. Refer to Understanding Spanning-Tree Protocol Topology Changes for more information on this process. This topology change mechanism is deeply remodeled in RSTP. Both the detection of a topology change and its propagation through the network evolve. Note: As long as the TC While timer runs on a port, the BPDUs sent out of that port have the TC bit set. BPDUs are also sent on the root port while the timer is active. It clears the MAC addresses learned on all its ports, except the one that receives the topology change. It starts the TC While timer and sends BPDUs with TC set on all its designated ports and root port (RSTP no longer uses the specific TCN BPDU, unless a legacy bridge needs to be notified). This way, the TCN floods very quickly across the whole network. The TC propagation is now a one step process. In fact, the initiator of the topology change floods this information throughout the network, as opposed to 802.1D where only the root did. This mechanism is much faster than the 802.1D equivalent. There is no need to wait for the root bridge to be notified and then maintain the topology change state for the whole network for <max age plus forward delay> seconds. In just a few seconds, or a small multiple of hello-times, most of the entries in the CAM tables of the entire network (VLAN) flush. This approach results in potentially more temporary flooding, but on the other hand it clears potential stale information that prevents rapid connectivity restitution. Each port maintains a variable that defines the protocol to run on the corresponding segment. A migration delay timer of three seconds also starts when the port comes up. When this timer runs, the current STP or RSTP mode associated to the port is locked. As soon as the migration delay expires, the port adapts to the mode that corresponds to the next BPDU it receives. If the port changes its mode of operation as a result of a BPDU received, the migration delay restarts. This limits the possible mode change frequency. For instance, suppose Bridges A and B in the preceding figure both run RSTP, with Switch A designated for the segment. A legacy STP Bridge C is introduced on this link. As 802.1D bridges ignore RSTP BPDUs and drop them, C believes there are no other bridges on the segment and starts to send its inferior 802.1D-format BPDUs. Switch A receives these BPDUs and, after twice hello-time seconds maximum, changes its mode to 802.1D on that port only. As a result, C now understands the BPDUs of Switch A and accepts A as the designated bridge for that segment. Notice in this particular case, if Bridge C is removed, Bridge A runs in STP mode on that port even though it is able to work more efficiently in RSTP mode with its unique neighbor B. This is because A does not know Bridge C is removed from the segment. For this particular (rare) case, user intervention is required in order to restart the protocol detection of the port manually. When a port is in 802.1D compatibility mode, it is also able to handle topology change notification (TCN) BPDUs, and BPDUs with TC or TCA bit set. RSTP (IEEE 802.1w) natively includes most of the Cisco proprietary enhancements to the 802.1D spanning tree, such as BackboneFast, UplinkFast, and PortFast. RSTP can achieve much faster convergence in a properly configured network, sometimes in the order of a few hundred milliseconds. Classic 802.1D timers, such as forward delay and max_age, are only used as a backup and should not be necessary if point-to-point links and edge ports are properly identified and set by the administrator. Also, the timers should not be necessary if there is no interaction with legacy bridges.